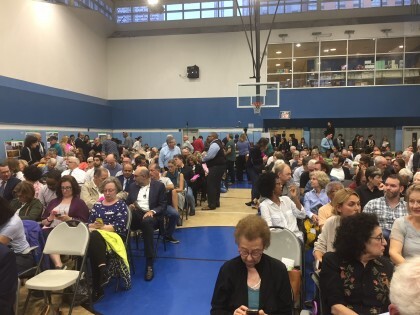 A large crowd assembled for Thursday evening’s meeting at which City Department of Transportation officials discussed plans for the reconstruction of the Brooklyn-Queens Expressway below Brooklyn Heights. I took the photo some minutes before the program began; by the time it did there were even more standing in the back or along the sides, and some were turned away because of lack of space. The size of the crowd, almost all of whom made the trek from the Heights to Myrtle Avenue just beyond the Flatbush Avenue Extension, was occasioned by the DOT’s recent announcement of an “innovative” plan to build a temporary elevated highway that would replace the Brooklyn Heights Promenade for six years and put highway traffic, including many trucks, close to residences and playgrounds. These are my takeaways from the meeting; for other accounts see The Brooklyn Paper and Curbed. Nothing is settled. DOT Commissioner Polly Trottenberg said that this meeting was only the first of many public events to be held as part of the environmental review process that will continue from now until 2020, when the request for proposals to design and rebuild the BQE will be issued. While the DOT’s Chief Engineer, Robert Collyer, stated his preference for the “innovative” plan, he allowed that the decision on how to proceed would be made as a result of the environmental assessment. Even the tunnel option is still a conceivable outcome, although DOT’s Senior Program Manager Tanvi Pandya noted that the only tunnel alignment the DOT considers feasible would place its northern entrance and exit north of both the Brooklyn and Manhattan bridges. This means that traffic to and from these bridges would still have to use the present BQE alignment, or else be routed over local streets. Other means of reducing the traffic burden on the BQE, such as putting tolls on the East River bridges and effecting congestion pricing in Manhattan, would require cooperation at the state level. State Senator Brian Kavanagh, addressing the meeting, said he would support whatever state actions were necessary. Any action with regard to the Verazzano Bridge tolls would require federal approval. The temporary highway may be re-routed over part of Brooklyn Bridge Park. This was suggested by a local resident during the question and answer period, and was also alluded to by City Council Member Steve Levin, who noted in his remarks at the meeting, “there are these berms ….” The Wall Street Journal reports that, after the meeting, Commissioner Trottenberg expressed willingness to consider this option. No matter what, the Promenade must be rebuilt. In her opening remarks, Commissioner Trottenberg said that like many of Robert Moses’s structures, the cantilevered portion of the BQE “was not built to last.” Ms. Pandya noted that the Promenade is part of this “not built to last” structure and that, while it doesn’t bear the weight burden that the BQE lanes below do, it is still structurally unsound. The question is whether the rebuilding of the Promenade will be done in one fell swoop (and, under the “innovative” plan, following a six year closure) or in segments, allowing access to parts of the Promenade while work is done on others. Direct access from Columbia Heights to DUMBO, Brooklyn Bridge Park, Squibb Park, and Hillside Dog Park will be interrupted. This is because the bridge that carries Columbia Heights over the BQE must be removed during the reconstruction. This will also entail temporary loss of the Harry Chapin Playground, which sits atop that bridge. Asked about the effect of the “innovative” plan on the Pierrepont Playground, which would abut the temporary elevated highway, Ms. Pandya said the playground would be all right. There were also assurances that, apart from the access issue, Hillside Dog Park would not be affected. Existing BQE environmental problems may not be cured. During the question and answer period, Willowtown Association member Martin Hale said he had measured noise levels from BQE traffic at Adam Yauch Park, near his home, and found they sometimes exceeded eighty decibels. He said the federal regulations governing environmental assessments included provisions allowing the grandfathering of pre-existing conditions or those that cannot be mitigated by technically available means, and asked if the DOT would rely on these. Mr. Collyer said they would not rely on them with respect to the construction work, and would do their best to mitigate any noise and air quality problems. However, no assurance was given that, following completion of the project, pre-existing environmental problems would be alleviated. Update: The BHA has now announced its opposition to the “innovative” proposal and urged the DOT to “work with the community to identify and evaluate other options that do not prioritize motorists at the complete expense of residents.” The BHA has yet to take a position. The first speaker during the question and answer period was Peter Bray, Executive Director of the Brooklyn Heights Association. He began by comparing the available options to the circles of Dante’s Inferno, an analogy with which Commissioner Trottenberg agreed. Mr. Bray said he had heard from many Heights residents, all of whom were strongly opposed to the elevated highway proposal. He said the BHA “will listen to all alternatives and be responsible to the community.” He also noted concerns that the city would run short of money needed to complete the restoration of the Promenade. Commissioner Trottenberg replied that it’s not up to DOT which option to choose, that there are “many stakeholders” as well as those directly affected by the elevated highway proposal, and that the “Design/Build” procedure authorized by the state for the project meant that the contractor would agree to a firm price. Ms. Pandya added that bonds and insurance would cover the contractor’s obligations. Trottenberg and the NYCDOT had several assumptions that underlay the two options presented. The most significant one was that not one inch of Brooklyn Bridge Park land would be used. That assumption is simply mind boggling. If, instead of resting a six lane interstate on top of the Promenade and directly next to people’s homes, the temporary roadway could be run over Squib, the berms, and (if needed) the subway air shafts, that would seem a solution that, while deeply unpleasant to the neighborhood, would not present the pollution or noise endemic to the other proposals. In addition, by putting the roadway off the footprint of the construction site, one would think that could speed up the process. I am by no means an engineer, but I find it deeply disturbing that such a solution was not even looked at because of the assumption that not one inch of BBP could be used. We need to talk to our state representatives to ensure that BBPC participates as our neighbor in this conversation and work with us on a solution that makes more sense than these two crazy plans. We are not talking about closing or destroying the park, but rather using small areas (such as the berms) on a temporary basis. BBPC needs to offer to join this conversation. There is a flawed basic assumption here. The proposal is not that a six lane highway be built on top of the promenade. The proposal is that a six lane highway be built next to the promenade, necessitating it’s closure. Reaction without facts perpetuates Trumpian behaviors. You have your facts wrong. I was at the meeting. You can look at the proposals on the BQE site. The elevated roadway would run exactly where the Promenade is — replacing it (temporarily… ~6-10 years temporarily). I wouldn’t get your hopes up too high for a “BBP solution”. IMHO The meeting was a dog and pony show, the DOT is clearly in favor of the “innovative” plan, from an engineering, construction and cost point of view, they’re right. Even though they said it would ultimately be decided by the “environmental study” The study will most certainly agree, as it is the shortest construction time, and least likely to divert traffic onto local streets. This announcement to “look into other solutions” is only a move to placate us. Furthermore, there is no practical reason to divert the temporary roadway “over the berms” for at best a thousand or so feet, it would still have to be in line with the existing roadway passing the buildings at the southern portion and still have to go over Columbia Heights at the northern end. Doing that would also increase the complication, costs and time significantly. Remember, all of it needs to be rebuilt so all you would gain is a few more months of the Promenade as it needs to be replaced as well. Pollution and noise would be basically the same, moving it a hundred feet farther away won’t make much of a difference. The only third option that would save us from this nightmare is a Tunnel. I’d rather lose the Promenade than the Park, though neither is ideal and both would be terribly disruptive. You’re incorrect. As they showed in their presentation, they hope to run the highway in PLACE of the Promenade, not next to it. If the plan to turn the promenade into a temporary highway is implemented, how high/thick of a wall is planned to protect the neighborhood? The DOT did acknowledge there would be a sound attenuation wall and it is in some of their 3d renderings, but they didn’t get into specific details. The one thing we must be vigilant about is that this process doesn’t pit neighbor against neighbor . . . there are already grumblings about BBP and Pierhouse as somehow “bad guys” in this situation (?) Just remember, BBP caters to many from throughout the City, not just those privileged to have Promenade views, and Pierhouse is filled with families who also deserve consideration. The only solution that seems rational (I agree they aren’t going to really come up with something new) is to focus on the “traditional approach” with some modifications to street rerouting to limit the impact on all neighborhoods. That’s not the choice as I understand it. No one would lose the Park if the highway was on the berms. They would just lose the berms. I completely agree with you. This should not be neighbor against neighbor. People throughout the city and the world visit both the Park and the Promenade. This is about inspiring our public officials do better and devise a truly forward thinking solution. The Brooklyn Heights Association has now had at least one week to digest this. What is their position? Breaking news: they are now against it. They are also urging the DOT to consider solutions that involve pushing the temporary roadway (if there is one) west. Agreed on all points. The “traditional approach” should still be what we as a neighborhood push for. Also keep in mind: just because the city says a highway on the promenade is temporary doesn’t mean that it will be. Once they have the big structure for a highway in place, there’s less incentive to return it to a pedestrian promenade some day (especially if $ runs out). We need to treat this as if it’s a permanent solution. And trust me, it will NOT be a pleasant one to have on our doorstep. The information has been widely known for almost two weeks and I’m guessing BHA had at least a bit of an earlier heads up. I would think by now it should be painfully obvious that you need to fight these plans tooth and nail from the moment they come to light. The two real estate projects in BBP are a prime example of what happens when you give up any kind of a head start. Yes, I was referring to the two options initially put on the table. But a tunnel is definitely a more forward-thinking solution. The BHA was extremely heartened by the strong attendance last Thursday evening at the Department of Transportation’s presentation of their proposed approaches to the necessary reconstruction of the BQE. Of the two options, first, a lane-by-lane reconstruction (“Traditional Approach”), and second, a temporary 6-lane highway on the Promenade to expedite reconstruction of the roadway below (“Innovative Approach”), DOT gave clear preference for the second, “Innovative,” option. For those who were not present at the meeting, the full presentation and the Q & A session can be viewed online. At the meeting, all those who spoke were united in opposition to the “Innovative Approach”, condemning the air pollution, noise, visual intrusion, and the loss of the Promenade for six or more years. Some speakers expressed fear that the Promenade would not be rebuilt as promised. In addition, all of the calls, emails, and visits to the BHA office by members of the community have been opposed to the Innovative Approach. The message to DOT is clear: Back to the Drawing Board. The BHA calls upon DOT to work with the community to identify and evaluate other options that do not prioritize motorists at the complete expense of residents. In addition to the “Traditional” incremental, lane-by-lane approach, DOT must consider other locations for the temporary roadway, including pushing it west of Furman Street. • considering other traffic management measures, such as HOV lanes. The BHA is committed to leading a campaign to protect the Heights community, as we did in organizing a borough-wide campaign to secure Design-Build authorization. We ask that DOT take the Innovative Approach off the table. We need to see more options, and we ask that DOT listen to and be responsive to the concerns of our community. Please forward this email to your friends and neighbors. Join the BHA in protecting the neighborhood. Let us know your thoughts. It looks like the BHA just decided to pit the neighborhood vs. the Park (“west of Furman”). Not at all neighborly.. .
It’s not obvious to me that routing west of Furman implies greater harm to Pierhouse nor harm to the park. But yes, Pierhouse is one of many residences that needs consideration in whatever plan goes through. 1) the only viable route runs nowhere near the approaches to the Brooklyn and Manhattan bridges. 2) That would require condemning property on a larger scale. And I suppose 3) they don’t know how to build tunnels. But that seems like more of a cop out. Personally I’d like to see a serious comparison of all major options so we can analyze these different variables more coherently. I’d certainly support a tunnel if it was viable. If it’s built over part of BBP, it will be torn down. The innovative plan seems to be the most logical plan relatively speaking if the tunnel option is out of the question in Albany. Their leadership and support will be crucial. I concur. Love the berms or hate them, they are clearly more attractive than a disused former temporary highway. There is quite a lot of space between Furman St and the tip of the berms, so I would hope that the highway would not be plopped directly on top of them, but rather flush with the peaks so that they roughly track the existing BQE in terms of height. There is only one place “West of Furman” and that is BBP. Either that or the river – which I am fully in favor of!